A quick piccy of me laughing like a goose with Karen & Haylee. 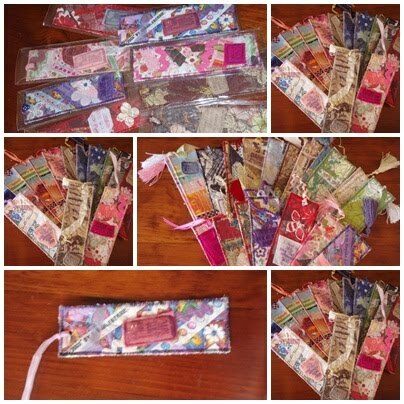 Here are my latest Bookmarks that I have completed, over 35 made this time, 20 have gone to the shop. We have now sold 115 of these at work. I am pretty chuffed with that. I have also made 8 for the SECET fundraiser and have one to giveaway as well as a bundle spare ready for whatever. Fabulous bookmarks. I bet they sell well. Very nice bookmarks. I'd be putting my contact details on one of these if I had one in case I left it in a library book as they all seem to be different and that makes them special!! Hmm, you've inspired me to try a few patchwork and crazy quilting ones with my scraps :). these bookmarks are GorGeous! loving the cheery colours!